The teams are to hold two fixtures before the league finish, but the standings are already determined and there will be no major changes to it. Having beaten Zorya in the last round (2-0), the Kyiv side claimed 78 points to become out-of-reach for the competitors. Shakhtar finished second, having 70 points for the day. Valeriy Kryventsov’s have extended a stunning run to 7 clean sheet wins in the last eight encounters. In the previous match, the Donetsk side thrashed Olimpik in Schaslyve (4-0). Roman Yalovenko and Giorgi Arabidze scored two goals in the Donetsk derby. The Georgian midfielder registered his second brace in a row and came out on top in this season top scorers’ race. For now, Arabidze have 14 goals to his name, with him being one goal clear of Miakushko from Dynamo and Olimpik striker Belenkyi. 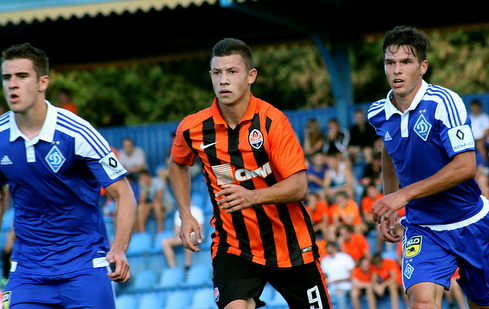 Dynamo started the youth league’s second stage with a defeat in Lviv (1-2). Then the White-and-Blues emerged victorious in the next seven games with a goal difference of 17-0, having secured the title early. In a clash versus Zorya, Kyiv side put a seal on a win through the goals by Bohdan Lednev and Serhii Chobotenko. However, the top scorer of the league spring part is Oleksii Schebetun, who scored 7 goals throughout the last three months. The rivals locked horns with each other three times this season. The first round match took place on September 9, 2016 in Schaslyve. In the first half, either of teams scored a goal: following a goal from the Donetsk captain Oleksandr Zubkov, Artem Besedin responded with a well-placed effort to level the scoreline. 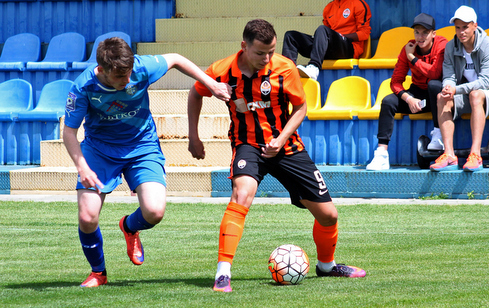 Immediately after the break, Shakhtar got in front came again courtesy of Andrii Boriachuk's effort, but they could not keep their lead. Zurab Ochigava and Volodymyr Shepelev secured a 3-2 victory for the Kyiv side. The second round match was was held on December 11, 2016 at Dynamo’s V. Lobanovskyi stadium and ended in a draw. At the same time, Shakhtar was closer to success and could have claimed a win in the dying minutes, however Oleksii Zinkevych failed to realize a spot-kick (0-0). The hosts won the third head-to-head fixture at Dynamo training facility (2-0), with Pavel Orehovskyi and Serhii Bulets making their marks on the scoresheet. Throughout the entire history of the youth and reserve teams, the rivals hold 27 head-to-head meetings: the Donetsk side have 7 victories under their belt, with 9 matches ended in a draw, as the White-and-Blues secured 11 wins. Shakhtar have secured 13 lopsided victories this season. Dynamo won 8 matches with a difference of three or more goals. At the league second stage, the opponents claimed an equal number of points - 21. At that, Shakhtar registered 21 goals in eight meetings, as the Kyiv team won 18 times.